Depending on traffic, a simple grocery run could easily feel like a road trip. But if you want all that driving to actually take you someplace cool, head to one of these car-accessible spots and get away from it all. Also, did you know you can drive a REALLY long time and still be in Texas? It's true! Note: Austin and San Antonio are omitted here, because, well, did you really need to be told those are road trip-worthy destinations? Dating back to 1957, there have been unexplainable lights in Marfa -- more specifically, large glowing floating spheres appear on the outskirts of town, anywhere form five-15mi Southeast of Marfa. These sightings happen anywhere from 10-20 times a year and there is no set pattern for when they’re going to happen. 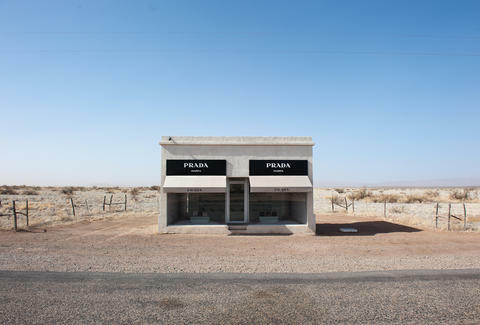 Besides the lights, you can see some of the crazy art they have, and even go "shopping" at the Prada that’s located in the absolute middle of nowhere. Marfa is like a living acid trip. Of note: Big Bend is about another hour if you want to keep the road trip going. 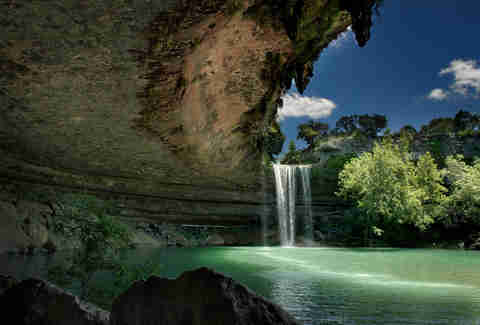 If you want to stay in Texas and have it SEEM like you’re not in Texas, then Hamilton Pool is one of your best bets. This grotto that has a 45ft waterfall pouring into a perfect swimming hole for those criminally hot days. There is only enough space for 75 cars, though, and once the lot is full it becomes one-in-and-one-out, so make sure you get there early or be prepared to wait for a bit. Also, there are no concessions, so make sure to pack a cooler. 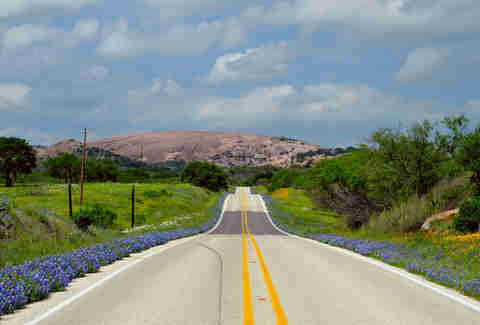 Enchanted Rock has attracted hikers, campers, rock climbers, bird watchers, stargazers, and stoners for many years. Located near Fredericksburg, it's technically a giant pink granite dome that was believed to have a spell cast on it by a Spanish conquistador. Fredericksburg, while not a SUPER happening town, is not without its charms. So, if you need a little R&R for a couple days, you can find some peace and quiet in the slow-moving town, which has some antique shops, B&Bs, and the like -- if you are looking to score some points with the lady. Redeem said points at Cooper's BBQ while you're down that way. Out in dusty West Texas near George Strait’s favorite town, Amarillo, you'll find the second largest canyon in the country. Since the other one is the Grand Canyon, second's not so bad. 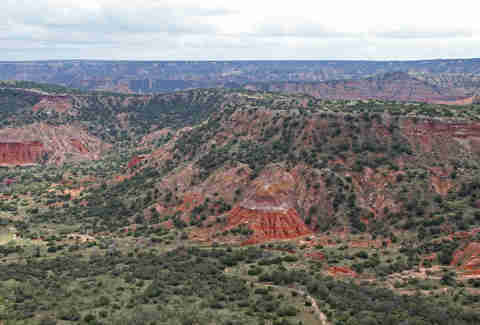 At Palo Duro you can hike, bike, drive, and even travel by horseback to explore the canyons. There are over 30mi of trails to keep you occupied. Once you are fully famished from hiking, you can drive up to Amarillo to the Big Texan Steak Ranch and compete in the 72oz steak challenge to replenish those precious calories you burned. 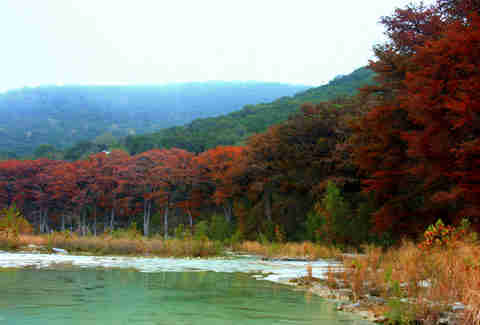 Located along the Frio River, Garner State Park is another prime spot to find a reprieve from the heat. 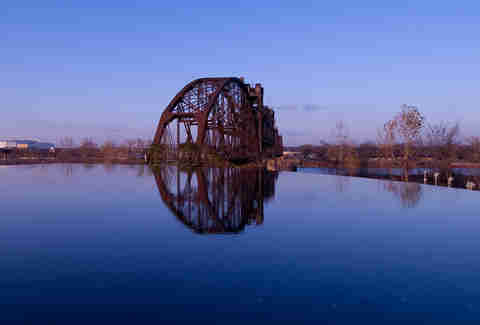 You can swim in the river, or grab an inner tube, canoe, or paddleboat and enjoy the water that way. There are 11 miles of scenic hike-able trails to enjoy as well, and campgrounds so you can do it all over again the next day. 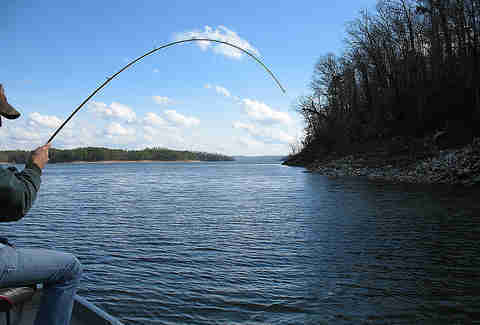 It’s not very often we will tell you to go to Oklahoma, but Broken Bow has earned the right to be a destination spot. This is an incredible outdoor getaway that isn’t too far, with everything from ATVs and horseback riding to golfing, fishing, and canoeing. There are plenty of cabins available for rent as well as RV parking if that's how you're rolling. Plus, it's not TOO far past the border, in case you have anxiety about leaving Texas. 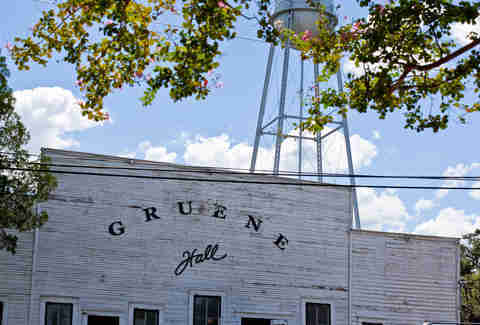 There are plenty of reasons to head this way, but to name a few, you have floating the river, Gruene Hall for music and two-stepping, fly fishing, wine tasting, and an impressive amount of live music. Oh wait, that wasn't enough. There's also The New Braunfels Smokehouse, Wurstfest, golfing... you get it. It’s a beautiful part of Texas, and you can even get a drive-through, bagged-up daiquiri to drink by the river. Yeah, that’s a real thing. Getting to gamble without flying to or driving to Vegas is a win -- getting to do it in about an hour is clutch. Just over the border in Thackerville, Oklahoma (you're actually OK... get it?) 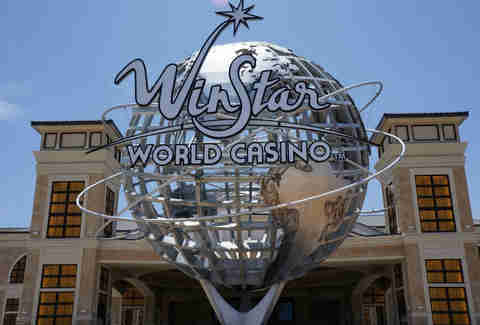 lays WinStar World Casino and Resort. In it you will find all of your gambling needs; poker, slots, horse-betting, black jack, even bingo and keno. If you want to lick your wounds and forget about all the money you just lost, you can grab a drink, lounge by the pool, and plan your attack to win it all back. There's also standout music and comedy on a regular basis if you want to (probably wisely) just steer clear of the tables to begin with. The Hill Country is really starting to blow up, with breweries, distilleries, and impressive restaurants seeming to multiply by the minute. 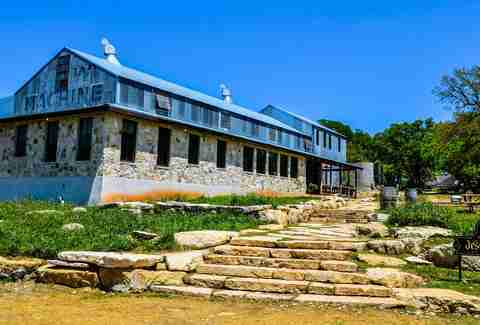 There's nationally acclaimed Jester King Brewery on the border of Dripping Springs and Austin, which brews some of the best sours/farmhouse beers on the planet. While there, you can eat at Stanley’s Farmhouse Pizza or jump across 290 and grab a slice at Pieous -- either way, you won’t be disappointed. Dripping Springs Vodka is in, you guessed it, Dripping Springs, but Deep Eddy just moved its operation out there as well. Blue Hole in Wimberley is one of the cooler swimming holes around -- it’s beautiful, clear water with rope swings all around and is warmer than Barton Springs in Austin... which is a win all on it’s own. Wimberley is also home to some nice wineries, beautiful scenic drives, and some great stargazing spots. We have already touched on Fredericksburg, but again, that’s a worthy stop as well. If you really need to get away from it all, Arkansas is a great choice -- there is tons of camping and beautiful scenery you can get to. Two Rivers Park, the Arkansas River Trail, and Riverfront Park in Little Rock are a fine way to get outdoors and breathe some fresh air. Just an hour back towards Dallas lays DeGray Lake Resort State Lodge, which has all of your camping needs. It also has lodges available if you would rather sleep in a climate-controlled environment -- it’s up to you.